DThe Codex Squarcialupi is an extensive jewelery manuscript of the Italian Trecento, written around 1410. It was named after the organist Antonio Squarcialupi, who owned it in the 14th century. It contains works by twelve well-known composers, arranged in chronological order. The beginning of each chapter is elaborately decorated by a miniature of the respective composer, in the tendrils on the left side of the sheet can be found Musical instruments such as flutes, lutes, psalteries, violins and a portative organ. The music is closely linked to the literature of their time. The composers are f.e. Francesco Landini, Johannes de Cascia, Jacobo de Bologna, Lorenzo de Firenze. The songs of the Codex are one to three voices. Incredibly complex contrapuntal masterpieces are next to catchy songs, sometimes lyrical, sometimes powerful. With their poetic texts, the ballate, cacce and madrigale give a colorful picture of culture in the courtly and upper middle-class circles of the Italian Trecento. With varied instrumentations and the moderation by the musicians, the unusual repertoire is presented very lively. DThe Codex Squarcialupi is an extensive jewelery manuscript of the Italian Trecento, written around 1410. It was named after the organist Antonio Squarcialupi, who owned it in the 14th century. It contains works by twelve well-known composers such as Francesco Landini, Johannes de Cascia, Jacobo de Bologna or Lorenzo de Firenze, which are arranged chronologically. The music is closely linked to the literature of their time. The ensemble palatino87 celebrates the unusually complex but outstandingly beautiful pieces. In addition, a large number of catchy songs can be heard - sometimes poetic, sometimes powerful - that have not yet been recorded. 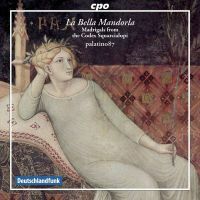 With their poetic texts, the ballate, cacce and madrigale give a colorful picture of culture in the courtly and upper middle-class circles of the Italian Trecento. The CD was produced in cooperation with Deutschlandfunk and published by CPO. More infomationen about Palatino87 can be found on the ensemble's website.